Central Okinawa encompasses Ginowan City, Chatan Town, Kadena Town and Yomitan Village on its west coast, the Katsuren Peninsula on its east coast and Okinawa City in between. It's also home to one of the biggest U.S. military bases in East Asia, Kadena Air Base. Boasting a large foreign population, including U.S. military personnel and also immigrants from various countries around the world, central Okinawa has an atmosphere all its own, where Western features are harmoniously integrated into the traditional Okinawan townscape. Each of the central Okinawan municipalities has its own unique charms. Offering a complete convention facility, Ginowan City plays host to a large number of international conferences and events. 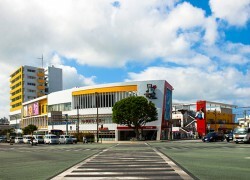 Chatan, on the other hand, is a popular shopping and dining destination with myriad shops and restaurants. Chatan is also home to Mihama American Village, a large commercial area comprising multiple shopping malls. Yomitan has a rather relaxing country atmosphere, and a number of art studios are scattered around the village. Okinawa City is known as a music mecca where a variety of musical events take place all year around. 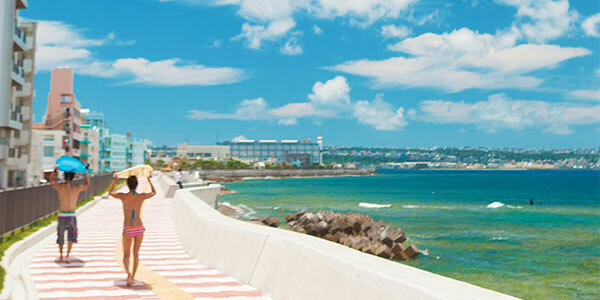 For people seeking to enjoy a stroll while looking out over the ocean, the coastal area of Chatan comes highly recommended. 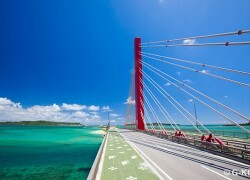 Central Okinawa, especially Chatan, Yomitan and the Katsuren Peninsula, is also a great place for scenic cycling. 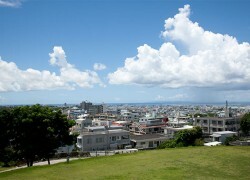 Ginowan City is located almost midway between Okinawa City and Naha City. MCAS Futenma as well as the U.S. Marine Corps’ Camp Foster is located in Ginowan City, sandwiched in between two national highways, Route 58 and Route 330. Used car lots line a four-kilometer-long stretch of Route 330 known as the “Ginowan Used Car Highway,” or in Japanese the ”Ginowan Chukosha Kaido.” Part of Route 58 is called the “Furniture Store Street” (“Kagu-ya Dori”), taking its name from the large number of shops that sell custom-made, Chinese and military surplus furniture. Uruma City was established in 2005 by the merger of four municipalities, Gushikawa City, Ishikawa City, Yonashiro Town and Katsuren Town, which were scattered along the Pacific coast of central Okinawa on the Katsuren Peninsula. The Ishikawa area, located in the northern part of Uruma City, is known for its bullfights. With a number of large shopping malls and residential areas having been developed in recent years, the Gushikawa area offers all the conveniences of a city and is becoming a very popular place to live. A U.S. military base, Camp Courtney, and Uken Beach can be found here. Located to the south of Gushikawa are the Katsuren Castle Ruins and another U.S. military facility, White Beach Naval Base. Kitanakagusuku Village is located in the district of Nakagami and is bordered by Chatan Town, Ginowan City and Okinawa City. The village hosts part of a U.S. military base and as a result a number of American-style houses and apartment buildings can be seen there. Some of those houses, however, have been turned into Western-style cafés over the years and now attract visitors from other parts of the island. The village has many historic sites, among them Nakagusuku Castle, of which the famous military commander Gosamaru was lord -- one of the few buildings that survived the Battle of Okinawa relatively unscathed and the best-preserved castle on the island. 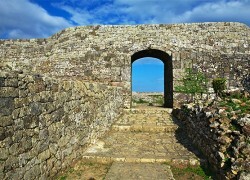 Popular with tourists, the Nakagusuku Castle Ruins has been inscribed as part of the UNESCO World Heritage. Near the ruins one can also find Nakamura House, a traditional Okinawan house that escaped the damage wrought by the bombing of Okinawa during World War II. 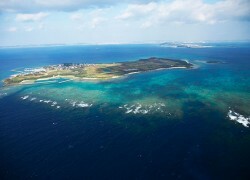 Okinawa City is located in the approximate center of Okinawa. About 36 percent of its land is occupied by a U.S. military base, Kadena Air Base, and the cityscape near Gate 2 Street and BC Street (Park Avenue Street) clearly reflects the influence of American culture on Okinawa City. On and around these main streets, shop and restaurant signs are written in English and prices are shown in U.S. dollars, adding to the “exotic” atmosphere. Located roughly between Naha and Okinawa City, Urasoe, Nishihara and Ginowan are known as college towns, with the University of the Ryukyus, Okinawa Christian Junior College and Okinawa International University within a stone’s throw of all three cities. Unique shops and eateries catering to students can be found throughout the area. There are also business offices, electronics shops, Makeman (the do-it-yourself home improvement center) and other stores. The area of Urasoe City where the U.S. Marine Corps’ Camp Kinser is currently situated is slated to be returned to Japan and is, therefore, attracting attention as a new development site. There are also plans to extend the Okinawa Monorail from Naha to Urasoe City in 2019. Tsuken Island is easily accessible and an ideal destination for a one-day trip. 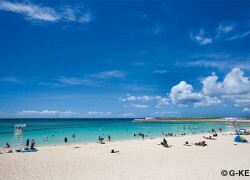 It can be reached by regular ferry and high-speed boat from Heshikiya Port on the Katsuren Peninsula. The rides take no more than 15-30 minutes depending on choice of transportation. Boats and ferries run five times a day.